The New York Times and the Washington Post essentially say that Barr was spinning/finessing/covering up Mueller's findings. 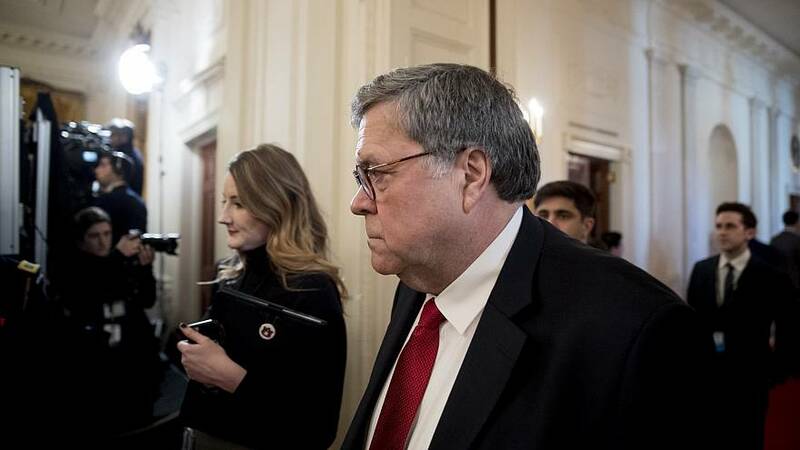 "Some of Robert S. Mueller III's investigators have told associates that Attorney General William P. Barr failed to adequately portray the findings of their inquiry and that they were more troubling for President Trump than Mr. Barr indicated," per the Times. "[M]embers of Mueller's team have complained to close associates that the evidence they gathered on obstruction was alarming and significant," the Post adds. "'It was much more acute than Barr suggested,' said one person, who, like others, spoke on the condition of anonymity because of the subject's sensitivity." More from the Post: "Some members of the office were particularly disappointed that Barr did not release summary information the special counsel team had prepared, according to two people familiar with their reactions… Summaries were prepared for different sections of the report, with a view that they could made public, the official said." Bottom line: It sure looks like what's in the full Mueller report is much more damaging to Trump than Barr's four-page summary - which was used by the White House and its allies to set the early narrative and spike the football. But as our NBC/WSJ poll shows, much of the American public always saw the Barr summary as a mere touchdown score — and not the end of the game. Yet the Trump administration's apparent action here is an important reminder when it comes to Mueller or the president's taxes or security clearances: A White House has the power to slow-walk findings and use that to its advantage. Meanwhile, Trump lawyer Rudy Giuliani said the anonymous comments to the Times and Post are from "disgruntled Mueller staffers who are rabid Democrat supporters." "If there was a significant difference Mueller would have corrected it as he did the false BuzzFeed report," he added. After we received Beto O'Rourke's fundraising haul for first quarter ($9.4 million since his launch three weeks ago), here's some context for all of the numbers we've seen so far. By the way, what does it say about the Dem 2020 candidates who HAVEN'T released their fundraising numbers yet? And what does it say if the mayor of South Bend OUTRAISES you? The candidates have until April 15 to file their reports to the FEC. Former Vice President Joe Biden released a two-minute video on Wednesday explaining/acknowledging the recent accusations from women who have alleged touches that made them uncomfortable. "Today, I want to talk about gestures of support and encouragement that I've made to women and some men that have made them uncomfortable," he said. Biden added, "I get it I get it. I hear what they're saying. I understand it. And I will be much more mindful. That's my responsibility." Hours later, the Washington Post reported that three more women came forward with accusations against Biden. One: Vail Kohnert-Yount, a White House intern in 2013, who said Biden "put his hand on the back of my head and pressed his forehead to my forehead while he talked to me. I was so shocked that it was hard to focus on what he was saying." Two: Sofie Karasek, part of a group of 51 sexual assault victims who appeared onstage at the Oscars in 2016 when Biden was there, who also said the former vice president placed "his forehead against hers." Three: Amy Coll, a young Democratic staffer in 2008, who says Biden leaned into her, "squeezed her shoulders and delivered a compliment about her smile, holding her 'for a beat too long.'" Of course, the other news from Biden's video is that it seems to have erased any doubts about his 2020 intentions. "In the coming months I expect to be talking to you about a whole lot of issues and I'll always be direct with you," he said at the very beginning of his video. If his rivals thought this story would chase him out of the 2020 race, well, he seems pretty determined. Sen. Michael Bennet, D-Colo., who has been considering a 2020 presidential run, says he has prostate cancer. "Late last month, I was diagnosed with prostate cancer. While hearing news like this is never easy, I am fortunate it was detected early, and as a result, my prognosis is good. During the upcoming Senate recess, I will have surgery in Colorado and return to work following a brief recovery," he said in a statement. A Bennet spokesman confirmed to NBC News that he still plans to run for president if he's cancer-free after his treatment. Bennet will appear on MSNBC's "MTP Daily" this afternoon in the 5:00 pm ET hour. On the campaign trail today: John Delaney (at 10:00 am ET) and Pete Buttigieg (at 10:15 am ET) address Al Sharpton's National Action Network conference in New York… Beto O'Rourke campaigns in Iowa, hitting Carroll, Denison and Sioux City… And Howard Schultz holds a town hall with Fox News. That's the share of Democrats who told PRRI pollsters last October that they would still consider voting for a candidate who had been accused of sexual harassment by multiple people as long as they agreed with them on the issues. Compare that to a majority — 56 percent! — of Republicans who said the same thing. We should note that the women who have come forward to speak about how Biden made them feel uncomfortable haven't necessarily categorized his behavior as "harassment." But these numbers show how Democrats and Republicans are on entirely different playing fields when it comes to their voters' tolerance of questionable behavior toward women. Don't miss the pod from yesterday, which asked what we should take away from Beto O'Rourke's Q1 fundraising haul. The fight for Trump's tax returns is on. Alex Seitz-Wald notes: The 2020 candidates' families look a lot like modern families in America — rather than the traditional ones of past generations. McConnell went nuclear on lower-level Trump appointees. Here's what that means. Trump agenda: Wanna get away? Trump has made his vacations much more complicated "by choosing to spend his weekends with his customers." Some conservative legal experts are critiquing Trump's efforts to dismantle ACA. Alexander Acosta is under fire in the Jeffery Epstein plea deal matter. Wilbur Ross is rejectinganother request to testify to Congress. The House Intel Committee wants to talk tokey inaugural planner Stephanie Winston Wolkoff. Wisconsin is looking like a tossup once again. Kamala Harris missed a vote on disaster aid while campaigning for president. The AP looks at how Sanders and O'Rourke are both targeting young voters.